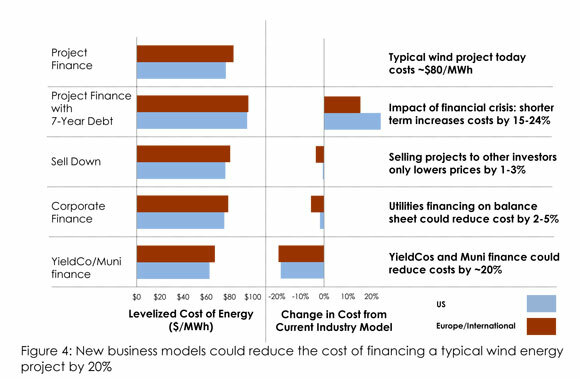 Widespread use of YieldCos should help wind and solar costs to drop more than 20% compared to current project finance models. Financial innovation has unlocked distributed solar and helped to drive down costs in recent years, but there is also ample room for new investment vehicles for large-scale wind and solar, according to a new study. Widespread use of YieldCos should allow for wind and solar costs to drop by more than 20 percent compared to current project finance models, according to the Climate Policy Initiative’s paper, Roadmap to a Low Carbon Electricity System. YieldCos earn cash flows based on real assets and then issue the earnings in dividends, offering a high yield to investors and lower-cost capital for renewable energy projects. There have been various YieldCos launched recently, including offerings from NRG Yield, Greencoat Energy, Pattern Energy and Nextera YieldCo. Funding renewable energy projects is just one issue that utilities face, and potentially not even the most pressing one. From transmission and distribution investment to system balancing and market operations, nearly every area of the utility business model is ripe for transformation. Solar and wind projects do not have the same operational risks, nor do they have the fuel risk of fossil fuel plants. “We should not be paying industries a high premium for operating a lower-risk asset,” said Varadarajan. Most utility-scale renewable energy projects are funded either through project finance, when a developer sets up a project company that can borrow money against the cash flows from the project, or through an investor-owned utility or independent power producer using its own equity and borrowing power to finance the project. In 2013, $279 billion out of the total $359 billion for all low-carbon investments, including renewable energy, energy efficiency, electric vehicles and other projects, came from balance sheet financing or project-level financing, according to CPI. Provide highly predictable, long-term cash flows. That includes paying out nearly all of the free cash generated from underlying projects to YieldCo owners, rather than retaining a substantial portion to invest in new projects, owning a diversified set of projects and investing in operational assets. Provide liquidity in the investment. The YieldCo should be exchange-traded and have a large set of investors that attracts financial sector analysis. Provide investment at low fees. CPI notes that one of the drawbacks seen by institutional investors with many current YieldCos is their high costs and fees. Become established as part of the portfolio of options for institutional investors. In many ways, this is a growing pain, but YieldCos need to work with investors, as well as financial regulators, to develop the YieldCo as an asset class. “Maturity could deal with most of these issues,” said Varadarajan, adding that ideally, YieldCos could spin off closed funds. To help YieldCos mature more rapidly, there could be a role for green banks, such as those in Connecticut or New York, added Varadarajan. YieldCos could play an interesting role in utility-scale renewable projects in coming years, but there is also a potential role for municipalities, CPI found. “Wind and solar are really bond-like investments,” said Varadarajan. “You could certainly see municipal bond financing” for renewable projects. He pointed to Los Angeles Department of Water and Power’s prepaid power-purchase agreement for wind power from the Milford Wind Farm in Utah that used Southern California Public Power Authority and municipal tax-exempt bonds. The approach could be more attractive in Europe, he noted, but it is certainly possible in the U.S. “Unlike institutional investors, municipalities could invest directly in renewable energy projects without the liquidity concerns, much as they invest in infrastructure,” the study authors wrote. Municipal financing could also be supported by infrastructure or green banks, where smaller municipalities would be able to access capital. There is no mention of 24/7 biomass/biowaste energy which is a key distributed renewable, especially considering PV and wind intermittency. Any application of YieldCos to biomass ?